When South Africa was turned over to the African National Congress, Afrikaners must have asked themselves how long the lights would stay on. They now have an answer: not much longer. The electricity utility, the largest of South Africa’s government-owned enterprises, is falling back on massive load-shedding. Also, there is a diesel shortage. If those in charge can’t keep military horses from starving, how are they going to keep power plants fed? This will provide widespread opportunities for further wealth redistribution on a more informal basis than what the government has been doing. A national blackout would result from demand exceeding supply, leading to cascading trip mechanisms. This would require restarting the power plants without electricity, which is called a “black start.” Expect the government to step in soon and forbid the use of such racist terms. A black start would take 2 to 3 weeks. When the lights come back on, the scene they illuminate could be so hideous that people will want them back off again. If you are planning a vacation, may I suggest some place other than the rainbow utopia of post-Apartheid South Africa? Guests at a holiday resort in northern KwaZulu-Natal had to be evacuated after an armed mob stormed the grounds and vandalised facilities [on December 21]. It is understood that the people, numbering in the hundreds and many of whom were armed with pangas, had pulled down a perimeter fence before swarming the Natal Spa resort near Vryheid. That’s why walls are needed, not fences. Pangas are machetes. The mob also wielded knobkerries, which are heavy wooden clubs with a knob on one end. Police sources said the mob had threatened staff members, warning them to vacate their posts or face violence. Guests were transported from the resort under guard while police negotiated with the mob. When the police negotiate with a mob, the mob has already won. In some cultures, those who seek employment fill out applications or send in résumés. But Africa has its own customs. Encouragingly, 28 members of the mob were actually arrested. If you really want to see African wildlife, stick to the safari tours. Staying at a holiday resort could be dangerous. Nicolaas Strydom, 31, was shot dead when 12 men, pretending to conduct business, set upon the farm owner Johan Terblanche on Kleinensorgen on Sunday. Strydom leaves a wife and three young children. He was their sole breadwinner. “I think it’s high time to pack up and leave; there is no other way,” said a shattered Terblanche, fighting back tears. Afrikaners will never get back the country they built over the course of centuries, now that they have been bullied by sanctimonious moonbats into giving it away. At least they can escape with their lives. Julius Malema has warned that White South Africans must not be allowed to leave the country, otherwise they will poison the land and render it unproductive. South Africa is run by the African National Congress; Malema’s Economic Freedom Fighters is still a minority party for now. However, EFF is already behind the wheel to some extent, as it seems to be driving the increasing radicalism of the ANC, which must struggle to keep up or lose relevance. After white property is confiscated without compensation, the weeds that will grow where farms now flourish may be fertilized by the bodies of South Africa’s last productive farmers. [TshekoTsk] was responding to a news article about Black First Land First (BLF) leader Andile Mngxitama’s call to kill white people over the weekend. TshekoTsk said that although he had never agreed with Mngxitama on any issue before, this time he did, adding that “action” had to be devised to kill white people such as Basson, who has recently been very critical of the EFF leadership, particularly Julius Malema. Basson has been referred to by Malema as a “racist thing.” When you get called a “racist” in South Africa, that means you are in big trouble for being white. Since the liberal media establishment embodied by Time is largely responsible for whipping up international pressure for South Africa to turn itself over to the sort of people running it today, don’t expect any features on Basson, even if he ends up getting disemboweled. Time was up for the people who settled the land and built South Africa into a First World nation the moment they turned it over to be looted to death by Nelson Mandela’s African National Congress. Now the ANC is scrambling to keep pace with Mkhaliphi’s still more radical Economic Freedom Fighters. Time will soon be up for anyone in South Africa who appreciates having a food supply sufficient to feed the country. In light of Africa’s exploding population and massive immigration to the West, let’s hope someone is learning from this. Recall Joe Biden’s enthusiastic prediction that whites will soon be a minority in the USA. A white minority will not be treated any better in the USA or Europe than in South Africa. If we fail to close the immigration floodgates and to keep leftists from power, South Africa is blazing a trail to utter ruin that other nations will follow. On tips from 1-Bodhisattva, Lyle, and R F.
•	Just 23% of national government departments obtained clean audits in the year through March, down from 30% the year before. •	Unauthorized expenditure rose 38% to R2.1 billion, while fruitless and wasteful expenditure surged more than 200% to R2.5 billion. •	Government entities incurred R51 billion in irregular expenditure. That excludes R28.4 billion in irregular expenditure by state-owned companies that aren’t audited by the Auditor-General. •	Contracts worth R6.5 billion couldn’t be audited due to missing or incomplete information. •	A 121% increase in irregular expenditure between 2014/15 and 2017/18. •	A 68% increase in unauthorised expenditure between 2014/15 and 2017/18. •	A 236% increase in fruitless and wasteful expenditure between 2014/15 and 2017/18. Under black rule, the rainbow utopia is looting itself to death. Evidence has accrued since the end of Apartheid that demographics do not permit full democracy in South Africa. If reproductive and immigration trends continue, the same will hold true for the rest of the West (see here, here, here, and here). Experts are warning that the government’s decision to make it easier to get a National Senior Certificate (NSC) Bachelor’s pass will mean universities will be flooded with applications. Up until March 2018, the minimum requirement for admission to degree studies was subject to a list of 20-credit subjects known as the “designated subject list”. It used to be that students needed to score at least 50% on the NSC exams on four designated subjects. No longer. Now, students only need to achieve this modest level of proficiency in any four subjects other than “Life Orientation,” presumably including white genocide, basket weaving, necklacing, et cetera. More challenging subjects like math and science can be left behind. It’s all part of the process of decolonization. As Affirmative Action demonstrates in the USA, just because students are accepted does not mean they can handle the coursework when they move on to college. No worries; if the tests are hard, the students can just riot. What is the point of going to college when education in general has been dumbed down to the point that no one learns anything? How about free food and shelter? 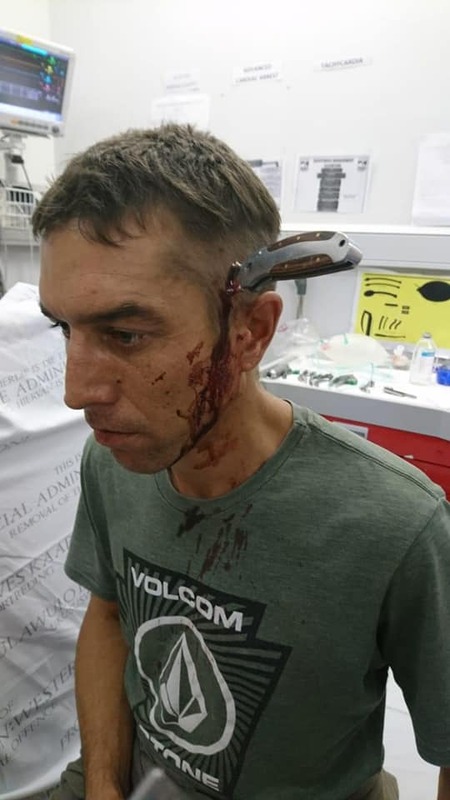 The cyclist – so far only identified as Shaun, a waiter from Somerset West in the Western Cape – was on his way to work on Monday afternoon when he was attacked and stabbed about 1.5km from his workplace. He rode to a doctor with the knife still sticking out of his skull. It looked surreal. Former world champion cyclist Wimpie van der Merwe, who was attacked in the same spot last week, shared Shaun’s incident on his Facebook page. Wimpie and Elize Jansen van Rensburg, a South African professional cyclist, were cycling from Gordon’s Bay to Strand when they were attacked at about 5.40am last Wednesday. Van Rensburg was seriously injured. They took her cellphone. Her husband was attacked and had his bike stolen in the same area. Another cyclist had a brick thrown at him and was mugged. No one of politically repugnant pigmentation is safe at any time in South Africa. The normal activities we take for granted in less diverse countries can only be engaged in at great risk. But it’s a small price to pay to avoid being called racist. As South Africa is decolonized, indigenous culture marvelously blossoms. No one should be too surprised that this includes cannibalism. Mbatha and his co-accused Lungisani Magubane‚ Khayelihle Lamula and a fourth man Thembiso Sithole – all 32 – were charged with the murder of a local woman, Zanele Hlatswayo. Sithole however died in prison this year. Mbatha … led police to a one-room house where he alleged that he was being held captive, forced to eat human flesh and create muti that would bring fortune. In the house were found what appeared to be an ear, jaws, and a bucket full of intestines. Muti is a term for “traditional medicine” in southern Africa — i.e., witchdoctor activities. South Africa should not hog all the indigenous cultural vivaciousness. We need to import more “refugees” from failed states in Africa so as to become more multiculturally enriched. On tips from ABC of the ANC and 1-Bodhisattva. On 16 October 2018, Ian Cameron, presented at Western Australia Parliament in Perth about farm murders in South Africa. Already 346 farm attacks and 46 farm murders have taken place in South Africa since 1 Jan 2018. During the 2017/18 financial year, 487 inmates died from natural causes, representing about 310 natural deaths per 100.000 of the inmate population. Eight-two of the deaths were from unnatural causes. Suicide is rampant. Largely due to overcrowding, South African prisons are “hell,” according to Police and Prisons Civil Rights Union spokesperson Richard Mamabolo. Sonke Gender Justice prisons co-ordinator Zia Wasserman said overcrowding created an environment for diseases such as TB, HIV and leptospirosis. Good thing only criminals have to go to prison. Just kidding. Under the ANC, you can be imprisoned for pointing your finger at a police officer, as human rights attorney Richard Spoor recently learned. You can also be imprisoned for using vocabulary that is currently regarded as politically incorrect. The very least we can do is stop the social justice that has destroyed South Africa from spreading. If we fail, John Bosman’s fate will be our own. Southern nicely lays her finger on the two reasons the mainstream media will not tell you the truth about what is going on in South Africa: (1) according to the liberal narrative, whites are oppressors, not victims; and (2) post-Apartheid South Africa is the template for what they want to do to the whole world, being the first country spawned completely out of moonbattery. The more people know about South Africa, the more they will recoil in horror from the progressive agenda. On a tip from Physicsnut. The union Solidarity was a key player in confronting tyranny in Soviet-dominated Poland. Now a union with the same name plays the same role in black supremacist–dominated South Africa. Incensed by a share scheme offered only to black staff, mainly white Solidarity has staged a go-slow protest against Sasol, a producer of petrochemicals. A full strike is planned for Thursday. Sasol, the world leader in technology that converts coal and gas to fuel, has sold 25 percent of its local operations to qualifying black employees, a foundation and the black public in a 21 billion rand ($1.5 billion) deal financed by the company. The company says this is an attempt to comply with black empowerment mandates. Sasol has operations in the USA. We’ll see if American regulators take an interest in the blatant discrimination, which would never be permitted if the victims were not Caucasians. Objecting to being victimized for racial reasons qualifies as “perpetuating racial polarization” only if you are white. Solidarity has resisted similar race-biased share schemes at the cement firm PPC and mobile operator Vodacom. It is a lost cause, given that whites relegated themselves to permanent second-class citizen status in 1994, but when it comes to putting up a fight, late is better than never. Good luck getting any help from the UN. Their skin is the wrong color. People of European descent make up about 9% of the population of South Africa. They are expected to fall to 10% of the world population by 2060. As globalism advances, South Africa’s problems become a preview of our own. The UK supports President Cyril Ramaphosa’s approach to land reform and believes it could potentially unlock further investment opportunities in Africa. What passes for “land reform” in South Africa has already been described. It entails seizing land productively farmed by whites so that it can lay fallow or be used for subsistence farming by blacks. Theresa May pledged to become the G7’s biggest investor in Africa by 2022, using the UK’s development budget to not only relieve poverty, but to create a sustainable investment environment for British businesses. By promising to “invest,” she is giving a green light to Ramaphosa to continue with his plans to seize white property without compensation. No need to worry about the starvation that will inevitably result, just as it did when the Breadbasket of Africa was forced to become the starving basket case Zimbabwe. British taxpayers will back up the ANC goons with “investment” — a.k.a. handouts. May squawks that land reform is wonderful so long as it is “legal” and “generated through a democratic process.” If two people cook a third person and eat him, that is fine with May so long as they vote on it first. South Africa serves as a reminder that democracy is not an end in itself. It is a means to an end, namely ordered liberty. It only serves that end in certain countries, and South Africa is not one of them. Get to work, Britons. You are going to have some massive taxes to pay. The financial sinkhole of Caucasian-free South Africa is only just beginning to open. Don’t worry, American taxpayers will help out too. No sooner does this newly constituted “tribe” (or band of bandits, really) launch a claim with the South African Department of Rural Development and Land Reform, than related squatters – sometimes in the thousands – move to colonize the land. They defile its grounds and groundwater by using these as one vast toilet; and terrorize, sometimes kill, its occupants and their animals in the hope of “nudging” them off the land. This sort of thuggery was baked into the cake of post-Apartheid South Africa. The farms aren’t always entirely given over to weeds. Sometimes the highly productive professional farms are replaced with subsistence level farming. Already, South Africa has become a net importer of food, just like Rhodesia, the former Breadbasket of Africa, which collapsed into dysfunction after it became Zimbabwe and whites were pushed off their land. The Western media is largely responsible for the nightmare that is unfolding in South Africa, having applied heavy pressure for that formerly advanced country to sacrifice itself on the altar of political correctness by abandoning Apartheid in the absence of a sane alternative. There is no remorse for having helped to murder a nation, thereby shrinking Western Civilization. The measure is designed to redress racial inequalities that have persisted for nearly a quarter-century after the end of apartheid in 1994. There will be racial inequalities until the last white has been murdered. Stealing property from competent farmers and giving it to people who are not competent to farm in the name of redressing racial inequalities is not only immoral but insane. That must be why farmers are murdered in large numbers throughout the world. Oh wait; they aren’t. The international average murder rate is 7 per 100,000, [Pieter Groenewald] noted. “In the case of mainly white farmers in South Africa, the figure is a staggering 133 per 100,000,” Groenewald said. Groenewald is the leader of Freedom Front Plus, which represents minorities in South Africa, thereby no doubt qualifying as a hate group according to the US media. The current murder rate will skyrocket if Julius Malema continues to drive the agenda. Stay tuned to hear piteous pleas from the Washington Post and AP for more US aid to South Africa after the confiscation of white farms inevitably leads to mass hunger as it did in Zimbabwe. On tips from StephaneDumas, Sean C, and KirklesWorth. Government has begun unilaterally expropriating farms against which land claims have been lodged and where price negotiations with owners have stalled. Two game farms in Limpopo appear to be the first properties that will be expropriated without following a court process. Not even farms that have been in the family for centuries will be immune from ludicrous land claims. If you won’t accept the pittance the government offers for the land, then you get nothing. Soon the government won’t even offer the pittance, although it may offer not to kill you if you abandon your property quickly. The next steps are within sight: whites are killed or driven out, their confiscated farms lay fallow, the economy collapses, starvation ensues, the government offers whites their land back but by then it’s too late. Zimbabwe, erstwhile Breadbasket of Africa when it was known as Rhodesia, has established the template. On tips from ABC of the ANC, 1-Bodhisattva, and Chuck A.
Malema on Thursday made good on a five-year old ambition of his party, and more solid promises earlier this year, by introducing a law to nationalise the SA Reserve Bank (SARB). The South African Reserve Bank Amendment Bill does exactly what Malema and his party said it would: it makes the Reserve Bank fully state owned, and transfers all powers currently held by its private shareholders to the Minister of Finance. [Malema’s bill] proposes no mechanism by which shares will be bought or taken away. Instead it simply repeals the major sections of the South African Reserve Bank Act dealing with private shareholders, or replaces mentions of “shareholders” with “the Minister”. Liberals deliriously celebrated the ascension to power of Nelson Mandela, a black nationalist with a communist and terrorist background. None should be surprised at the way this tragedy is unfolding. At least socialism won’t result in total economic collapse in South Africa, as in Zimbabwe and Venezuela. The liberal elite in Europe and the USA have too much invested in the legacy of their idol Mandela not to keep socialist South Africa at least half-alive with massive taxpayer-financed subsidies. If the Afro-Marxist horrors that replaced the Breadbasket of Africa with Zimbabwe can be repeated right next door in South Africa, clearly lessons are not learned by the denizens of the Dark Continent. It is unlikely that they will become more apt pupils of experience as their exploding population combined with suicidal bleeding-heart idiocy allows them to colonize other parts of the world. Yesterday, Rhodesia; today, South Africa; tomorrow, France. European Civilization, far and away the best thing ever to happen to the human race, is shrinking. Formerly advanced South Africa will not be the last First World nation to die.